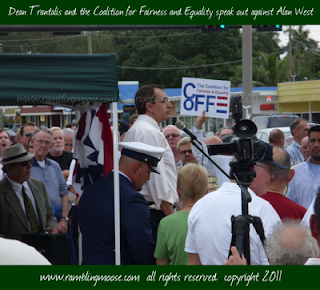 Last night at rush hour, the Coalition for Fairness and Equality had a rally to speak out against US Representative Alan West. The rally was well attended, and there were, as speaker Dean Trantalis (at the microphone) said, people from both the Democratic and Republican Parties there to speak out against the comments that Alan West made in the past. This was at Wilton Manors City Hall, and featured War Veterans, people from both sides of the aisle, and elected officials. It's good to see that people are beginning to finally shake off the Fox News mindset and start to speak up.